In 2016, South Korean violinist Ji Won Song won the ninth annual International Leopold Mozart Violin Competition in Augsburg and proved that she is not only brilliant as a soloist of virtuoso violin concertos but also possesses a deep understanding of chamber music. 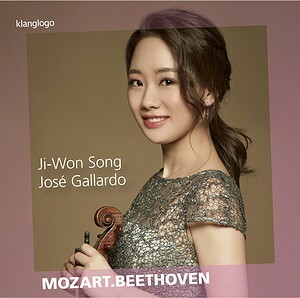 Together with her pianist partner José Gallardo, she presents a program that includes works by Wolfgang Amadeus Mozart and Ludwig van Beethoven as well as a repertoire composed later that refers directly to Viennese classical music. Pablo de Sarasate composed an effective showpiece with his Fantasy on Mozart's Magic Flute, a work that combines sophisticated playing technique with a sonorous violin tone, and Fritz Kreisler made use of a small Rondo of Beethoven as the basis for his work. The Classical works themselves are regarded as the touchstones that form an integral part of competitions and concert halls around the world today. Mozart's violin sonatas K. 376 and K. 481 as well as Beethoven's lyrical Romance for Violin in F major complete this cross-section as compositions for the instrument to which Leopold Mozart dedicated his influential Fundamental Principles of Violin Playing in the middle of the 18th century. 송지원은 2016년 제9회 레오폴트 모차르트 바이올린 콩쿠르(4년마다 개최)에서 1위와 청중상을 수상한 바 있다. 콩쿠르 특전으로 제작된 이 앨범에서 그녀는 모차르트·베토벤·크라이슬러·사라테의 작품을 차례로 선보이는데 그 곡들은 크라이슬러 ‘베토벤 주제에 의한 짧은 론도’, 사라사테 ‘모차르트 마술피리 판타지’처럼 서로 영향을 주고 받으며 만든 곡들이다. 따라서 네 명의 작곡가의 작품을 관통하는 69분 동안 그녀의 존재감과 특색을 느낄 수 있다. 맑으며 여유 있는 모습이 1992년 생의 연주라 느껴지지 않는다.